Some people think that because you have the same parents and share the same DNA, children would grow into adults who demonstrate similar characteristics and have the same values, morals and behaviour. Unfortunately, children from dysfunctional family backgrounds, grow and develop with a completely different view of the world, depending on which position they held within the household. Many children grow up believing that they were the black sheep of the family. 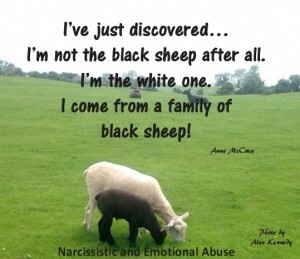 Maybe in reality you were the white sheep living within a family of black sheep. If there are two or more children in a family, one of those children is often seen by the parents as ‘the golden child’ who can do no wrong. The parent sees this child as a reflection of themselves and places high expectations on this particular child to do well at school and to excel at sports and hobbies. The golden child often develops the same characteristics as their controlling parent. They were not corrected or chastised by their doting parents when they were growing up so they grow up believing that they are never wrong and that their behaviour is acceptable. They may become egotistical, expect everything their way and have no regard for your feelings whatsoever. Now, let’s take a look at the black sheep. This child is blamed for everything that goes wrong in the family and can find themselves being blamed for doing something well ( doing something well paints a different picture and shows you are not as bad as the narcissistic parent makes you out to be). They are the scapegoat, blamed by not just their parents but also by their siblings. As a young child, this is a really difficult place to be. You may have been taunted and goaded by your brother or sister but somehow it was always your fault. The guilty party always feigned innocence and of course, they were always believed. You feel you can never do anything right no matter how hard you try. No one seems to care whether you do well at school or sports. In your mind, you don’t really matter, nobody cares. The scapegoat child often suffers deep pain and confusion progressing into adulthood with a very low opinion of themselves. Sadly, such low self-esteem may lead them into developing relationships with controlling people in their adult lives. Being treated poorly has always been the norm. If you can overcome the negative feelings about yourself, you will realize that being the black sheep in the family may not be so bad after all. You are not locked in that narcissistic dance with a narcissistic parent. You are free to do what you want to do with your life. On the other hand, the golden child is taken by the hand and pushed in a particular direction always trying to please their narcissistic parent. They will never be free to choose as you are. Jealousy between siblings is common in dysfunctional families. It is created by the controlling parent who knows that by treating their children differently, friction is likely to occur. Jealousy brings about division within the family with the golden child often bullying the scapegoat child. Sadly, this jealousy is likely to continue into adulthood, with the entitled, golden child, continuing to bully and berate their sibling. Being the ‘cherished’ child, they will grow up believing that they should inherit the family assets. After all, they continued to please their parents all their lives, whereas you, the black sheep, were always such a disappointment to them, so why should you deserve anything from their estate? There are no depths too low, to which they will not stoop to get their hands on the family fortune. We can’t change people and we can’t change how we are treated by our parents or siblings but we can choose whether or not we accept their behaviour. As adults we can choose to walk our own path and if that means distancing ourselves from certain people, maybe that’s the direction we will have to take for a peaceful and stress free life. Most children grow up believing they owe their parents a debt. In healthy families, that may be the case, but where keeping contact with a toxic parent affects your health and your sanity, no or minimal contact may be the only answer. We all have to make the decision based on our own family circumstances. Sometimes minimal contact can work with the implementation of strong boundaries. The precise story of my childhood. So terribly painful and, moreover, frightening. True that you are freer to make choices later, but the scars, in my case, blocked my being able to succeed. The fear engendered in childhood of provoking jealousy blocked me from standing out and excelling in the way I could have done. to you its maybe an excuse we all process things differently some like you lack empathy! The Golden boy is taking the family assests in my family now. After my Father passed, things escalated being that my mother is the main narcissist. Amazingly my sister backs them despite what they do. I unfortunately am quite a bit younger than the other siblings, 16 years under my brother & 10 years under my sister. They berated me at such a young age and I had no defense. Walking away is hard because I live close but I am trying. I’m married to the scapegoat. His mother has totally traumatised him. We went non contact nearly 9 years ago. The golden child is still under Mummy’s control, it’s horrifying to watch & really sad to see she can’t see her mother for what she is. My husband will not seek professional help. It’s been a hellish few years but we know we did the right thing going non contact. We also needed police involvement as Mother didn’t like our choice, the stalking & slander got beyond a joke. Thank goodness for a very understating community police man. Still doesn’t stop her bad mouthing me tho. Thank you so much for this page, it’s helped me a lot as the wife of the scape goat.